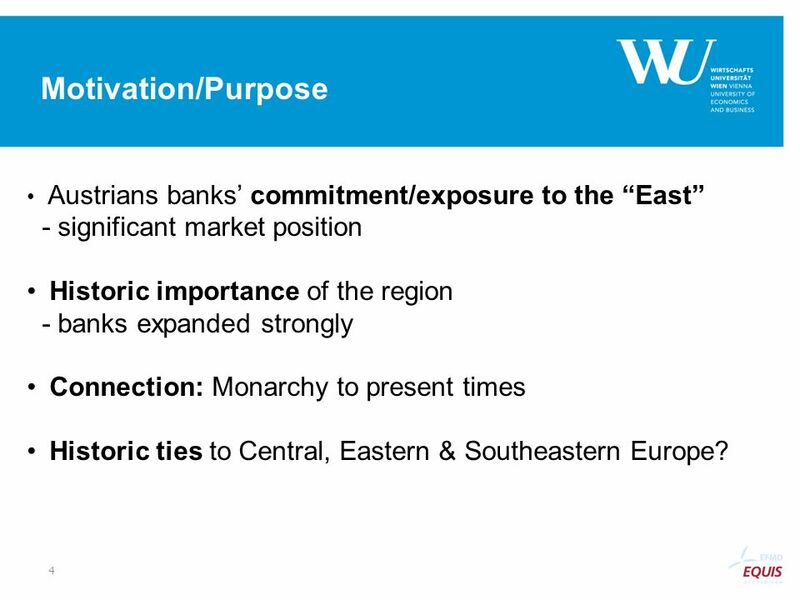 4 Motivation/Purpose Austrians banks’ commitment/exposure to the “East” significant market position Historic importance of the region banks expanded strongly Connection: Monarchy to present times Historic ties to Central, Eastern & Southeastern Europe? 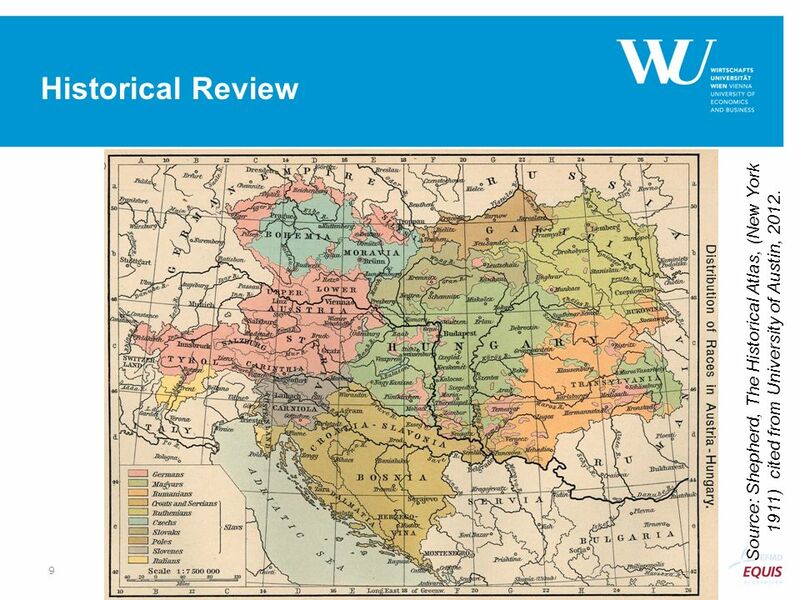 9 Historical Review Source: Shepherd, The Historical Atlas, (New York 1911) cited from University of Austin, 2012. Index (1880=100), Source: Rudolph, ‘The Pattern of Industrial Growth’, 94. 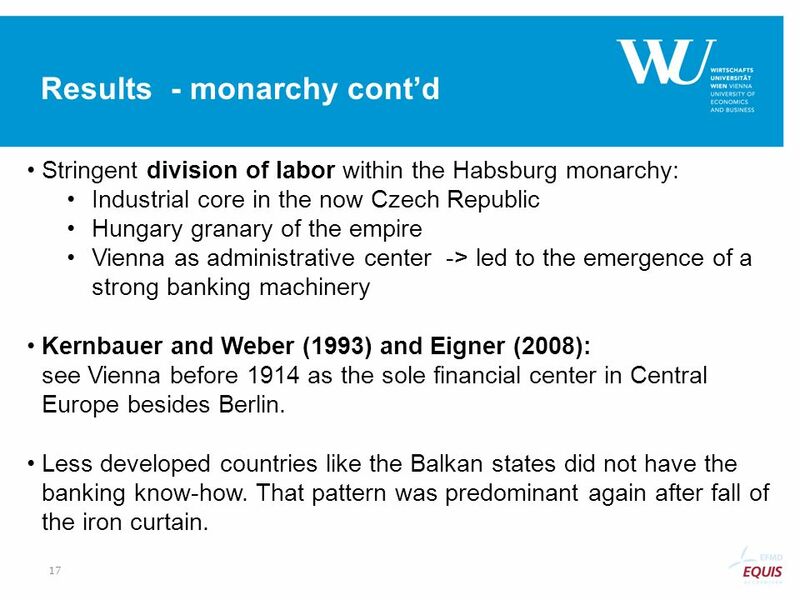 Stringent division of labor within the Habsburg monarchy: Industrial core in the now Czech Republic Hungary granary of the empire Vienna as administrative center -> led to the emergence of a strong banking machinery Kernbauer and Weber (1993) and Eigner (2008): see Vienna before 1914 as the sole financial center in Central Europe besides Berlin. Less developed countries like the Balkan states did not have the banking know-how. 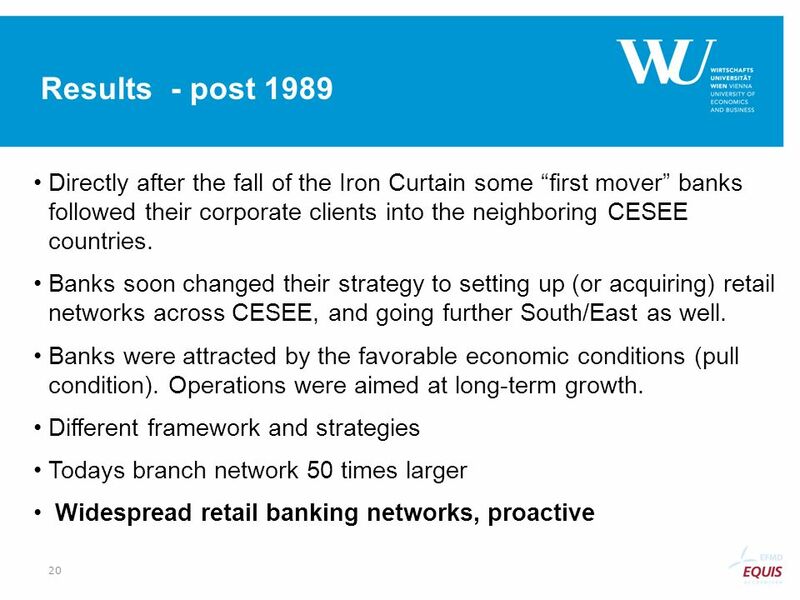 That pattern was predominant again after fall of the iron curtain. CZ 1999 2000 2001 2002 2003 2004 2005 2006 2007 2008 2009 2010 2011 Loans priv. ent. 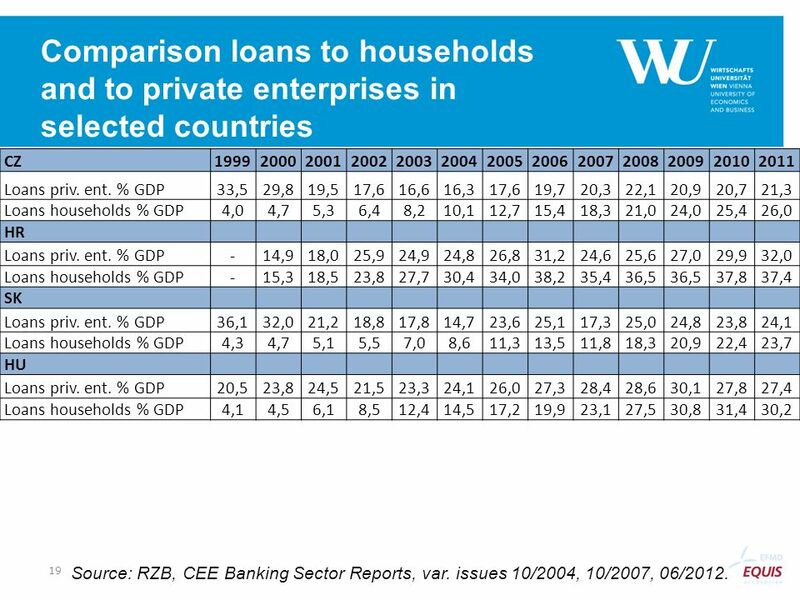 % GDP 33,5 29,8 19,5 17,6 16,6 16,3 19,7 20,3 22,1 20,9 20,7 21,3 Loans households % GDP 4,0 4,7 5,3 6,4 8,2 10,1 12,7 15,4 18,3 21,0 24,0 25,4 26,0 HR - 14,9 18,0 25,9 24,9 24,8 26,8 31,2 24,6 25,6 27,0 29,9 32,0 15,3 18,5 23,8 27,7 30,4 34,0 38,2 35,4 36,5 37,8 37,4 SK 36,1 21,2 18,8 17,8 14,7 23,6 25,1 17,3 25,0 24,1 4,3 5,1 5,5 7,0 8,6 11,3 13,5 11,8 22,4 23,7 HU 20,5 24,5 21,5 23,3 27,3 28,4 28,6 30,1 27,8 27,4 4,1 4,5 6,1 8,5 12,4 14,5 17,2 19,9 23,1 27,5 30,8 31,4 30,2 Source: RZB, CEE Banking Sector Reports, var. issues 10/2004, 10/2007, 06/2012. 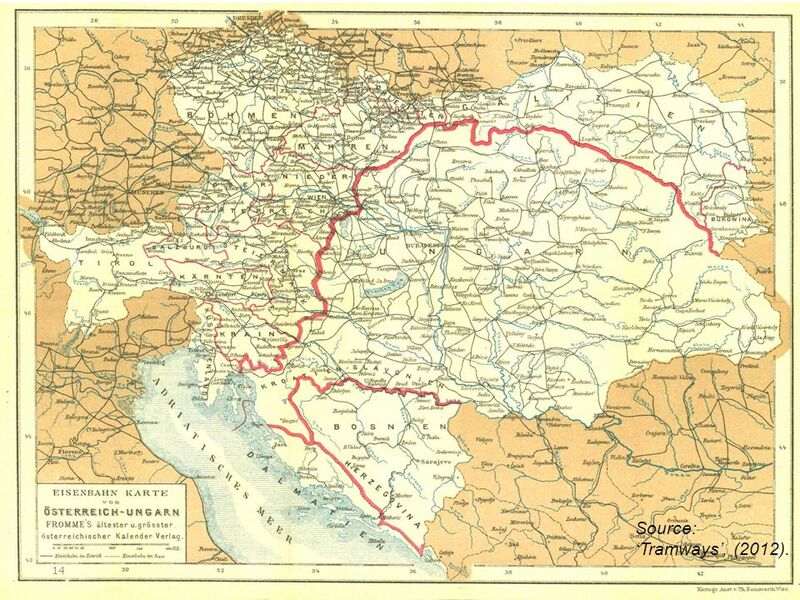 Source: Compass Finanzielles Jahrbuch für Österreich (1915). 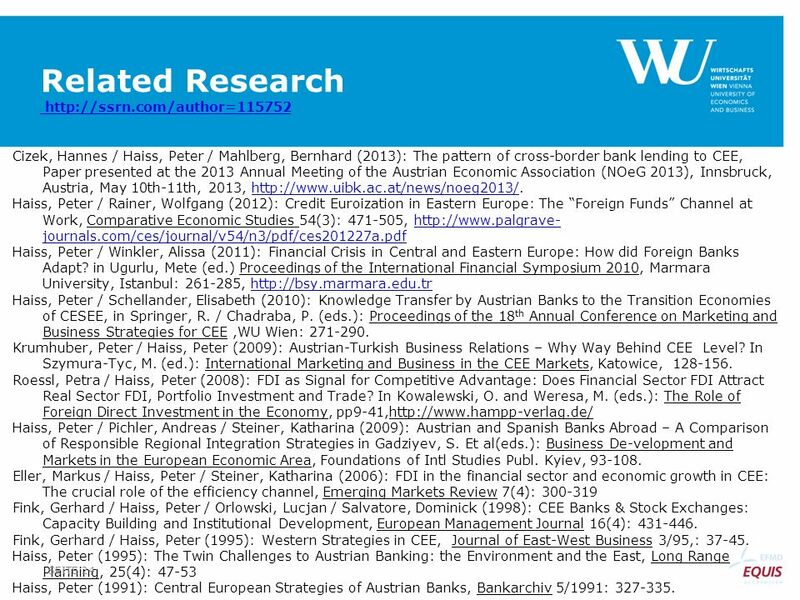 28 Bibliography (1) W. Altzinger, ‘Austria's Foreign Direct Investment in CEE: 'Supply Based' or 'Market Driven'?’, WIFO Working Paper no. 57 (1998). K. Bachinger, ‘Das Verkehrswesen‘, in A. Brusatti, Die Habsburgermonarchie 1848–1918, vol. 1, Die wirtschaftliche Entwicklung, Verlag der Österreichischen Akademie der Wissenschaften (Vienna 1973), K. Bachinger and H. Matis, ‘Österreichs Industrielle Entwicklung‘, in A. Brusatti, Die Habsburgermonarchie 1848–1918, vol. 1, Die wirtschaftliche Entwicklung, Verlag der Österreichischen Akademie der Wissenschaften (Vienna 1973), F. Baltzarek, ‘Finanzrevolution, Industrialisierung und Crédit-Mobilier-Banken in der Habsburgermonarchie‘ in O. Rathkolb, T. Venus, and U. Zimmerl (eds. 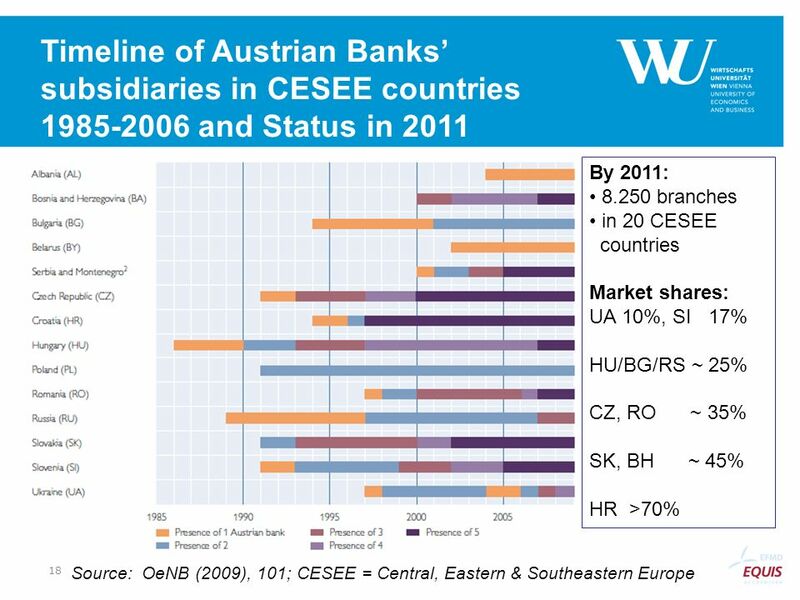 ), Bank Austria Creditanstalt, 150 Jahre österreichische Bankengeschichte im Zentrum Europas, Paul Zsolnay (Vienna 2005), S. Barisitz, ‘Banking transformation in CEE – from Communism to Capitalism’, South-Eastern Europe Journal of Economics 2/2009 (2009), R. Boschma and K. Frenken, ‘The Emerging Empirics of Evolutionary Economic Geography’, Journal of Economic Geography, vol. 11 issue 2 (2011), E. Bradacs and P. Haiss, ‘Das eklektische Paradigma im Bankensektor: Ergänzungen notwendig‘, in H. Zschiedrich and U. Christians (eds. ), Banken in Mittelosteuropa im Spannungsfeld von Transformation und Innovation, (Munich, 2007), F. Breuss, G. Fink and P. Haiss, ‘How well prepared are the New Member States for EMU?’, Journal of Policy Modeling, vol. 26, issue 7 (2004), P. J. Buckley and M. C. Casson, ‘The Internalisation Theory of the Multinational Enterprise: A review of the progress of a research agenda after 30 years’, Journal of International Business Studies, vol. 40 (2009), Compass Finanzielles Jahrbuch für Österreich, vol 1. (Vienna 1915). Creditanstalt, Ein Jahrhundert Creditanstalt-Bankverein (Vienna 1957). 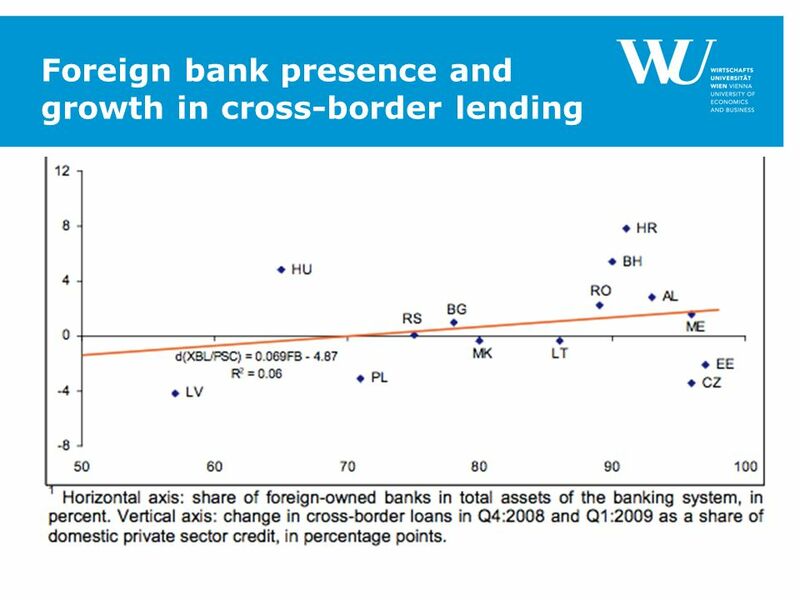 R. De Haas, Y. Korniyenko, E. Loukoianova and A. Pivovarsky, ‘Foreign Banks and the Vienna Initiative: Turning Sinners into Saints?’, IMF Working Paper No. 12/117 (2012). P. Eigner, ‘Die Habsburgermonarchie im 19. Jahrhundert: Ein Modellfall verzögerter Industrialisierung?‘, Beiträge zur historischen Sozialkunde, vol. 27, nr. 3/97 (1997), P. Eigner, ’In the Centre of Europe: Vienna as a Financial Hub, ’, in D. Feldman and P. Hertner (eds. ), Finance and Modernization - A Transnational and Transcontinental Perspective for the 19th and 20th Centuries (Farnham, U.K. 2008), M. Eller, P. Haiss and K. Steiner, ‘Foreign Direct Investment in the financial sector and economic growth in Central and Eastern Europe: The crucial role of the efficiency channel’, Emerging Markets Review, vol. 7, issue 4 (2006), G. Fink, P. Haiss, L. Orlowski and D. Salvatore, ‘Central European Banks and Stock Exchanges: Capacity-building and Institutional Development, European Management Journal vol. 16, nr. 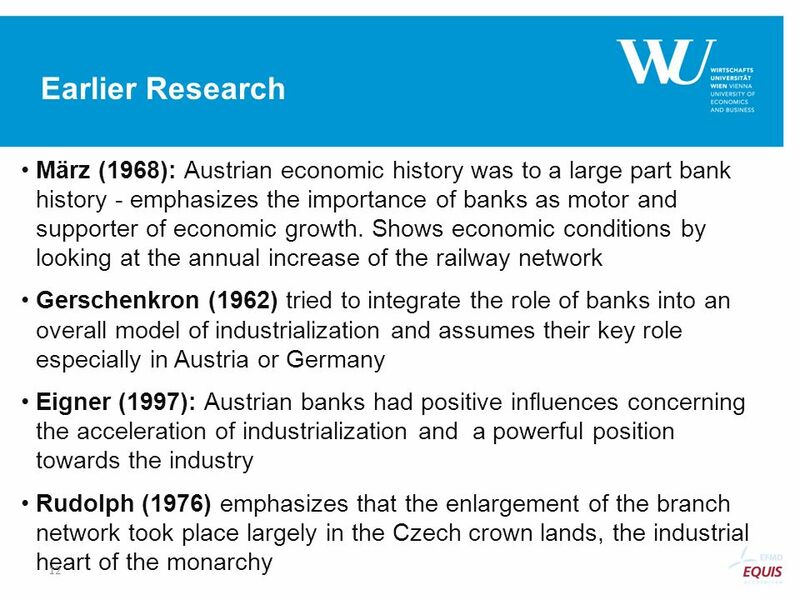 4 (1998), G. Fink, P. Haiss and M. von Varendorff, ‘Serbia´s Reform of the Banking Sector – Implications for Economic Growth and Financial Development’, Southeast European and Black See Studies, vol. 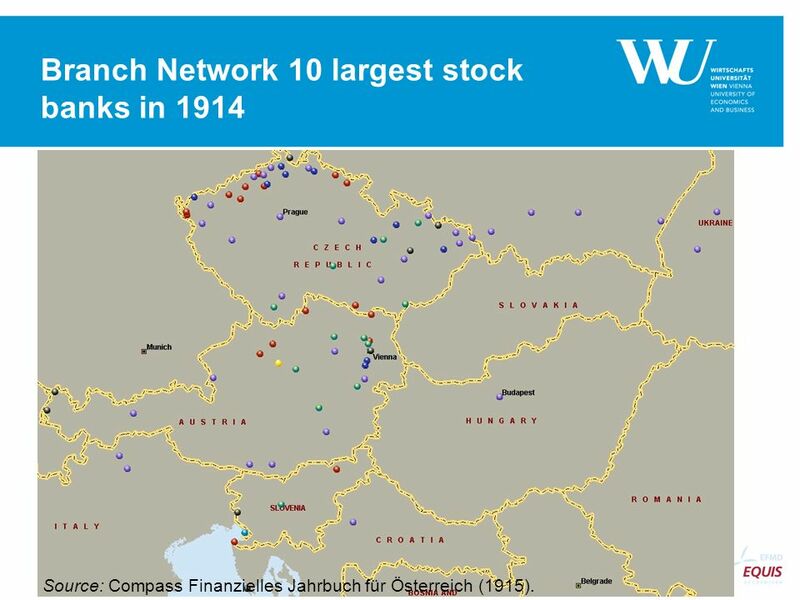 7, issue 4 (2007), M. Flandreau, ‘Banking Networks and European Financial Architecture on the Eve of the Industrial Revolution’, Paper presented at the European Association for Banking and Financial History e.V. (EABH) Conference (Frankfurt a. M., Germany, 2008). 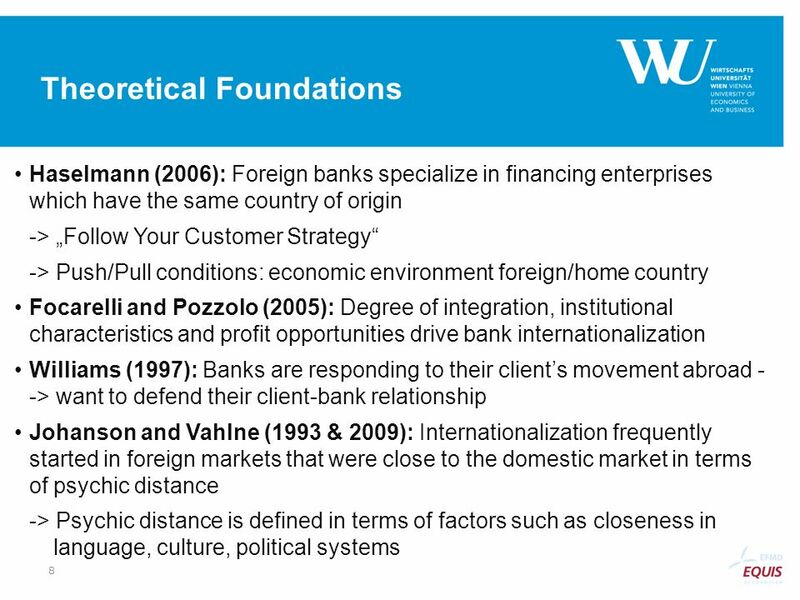 D. Focarelli and A. F. Pozzolo, ‘Where Do Banks Expand Abroad? 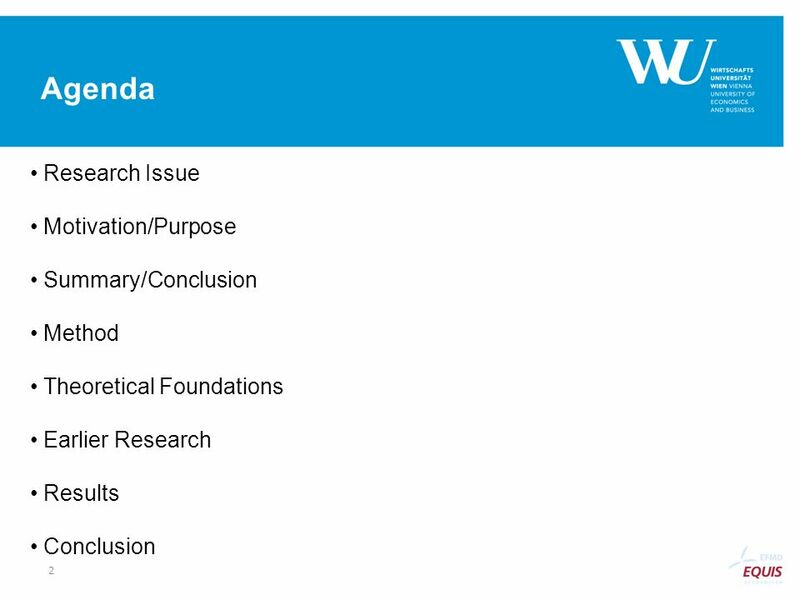 An Empirical Analysis’, The Journal of Business, vol. 78, issue 6 (2005), D. F. Good, ‘Financial Integration in Late Nineteenth-Century Austria’, The Journal of Economic History, vol. 37, nr. 4 (1977), D. F. Good, Der wirtschaftliche Aufstieg des Habsburgerreiches 1750 – 1914, (Vienna, Cologne, Graz 1986). 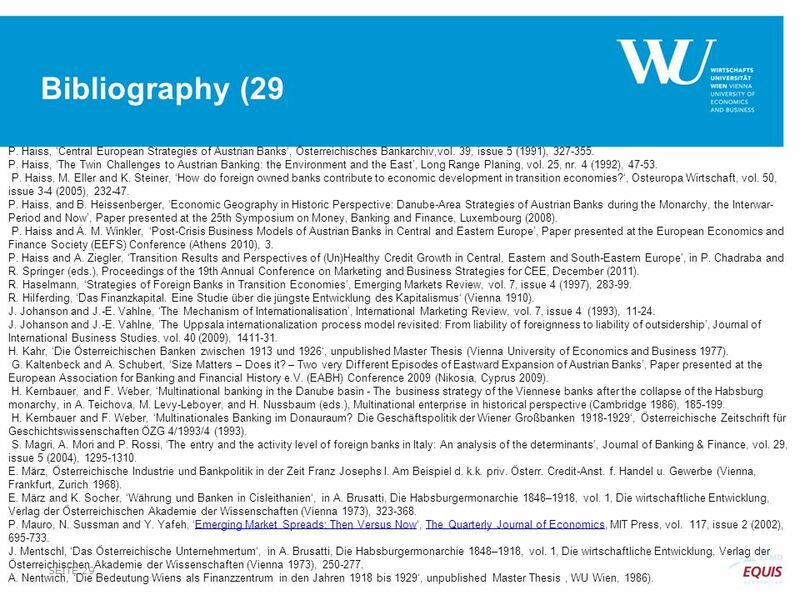 29 Bibliography (29 P. Haiss, ‘Central European Strategies of Austrian Banks‘, Österreichisches Bankarchiv,vol. 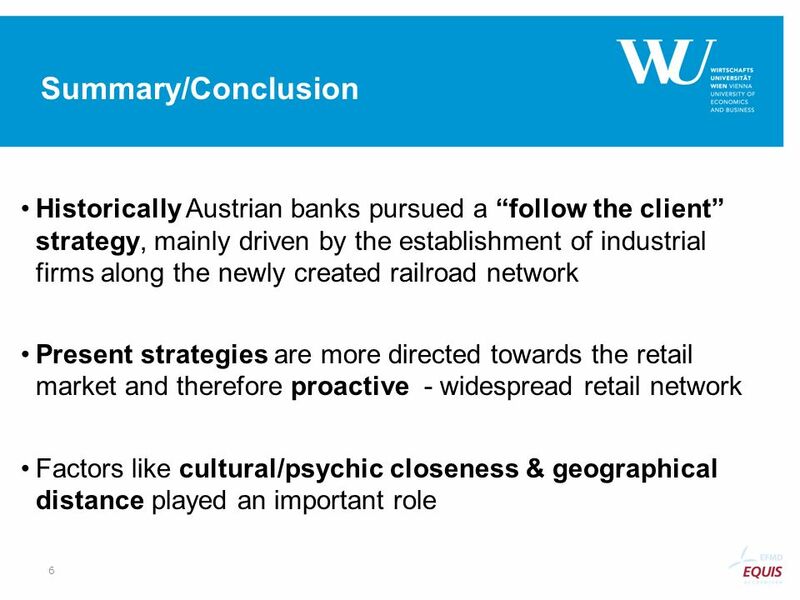 39, issue 5 (1991), P. Haiss, ‘The Twin Challenges to Austrian Banking: the Environment and the East’, Long Range Planing, vol. 25, nr. 4 (1992), P. Haiss, M. Eller and K. Steiner, ‘How do foreign owned banks contribute to economic development in transition economies?‘, Osteuropa Wirtschaft, vol. 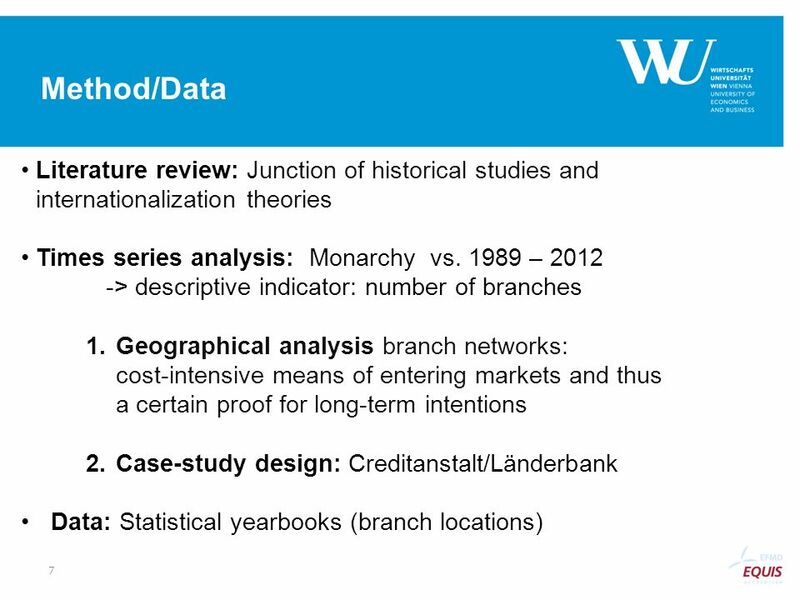 50, issue 3-4 (2005), P. Haiss, and B. Heissenberger, ‘Economic Geography in Historic Perspective: Danube-Area Strategies of Austrian Banks during the Monarchy, the Interwar-Period and Now’, Paper presented at the 25th Symposium on Money, Banking and Finance, Luxembourg (2008). P. Haiss and A. M. Winkler, ‘Post-Crisis Business Models of Austrian Banks in Central and Eastern Europe’, Paper presented at the European Economics and Finance Society (EEFS) Conference (Athens 2010), 3. P. Haiss and A. Ziegler, ‘Transition Results and Perspectives of (Un)Healthy Credit Growth in Central, Eastern and South-Eastern Europe’, in P. Chadraba and R. Springer (eds. ), Proceedings of the 19th Annual Conference on Marketing and Business Strategies for CEE, December (2011). R. Haselmann, ‘Strategies of Foreign Banks in Transition Economies’, Emerging Markets Review, vol. 7, issue 4 (1997), R. Hilferding, ‘Das Finanzkapital. 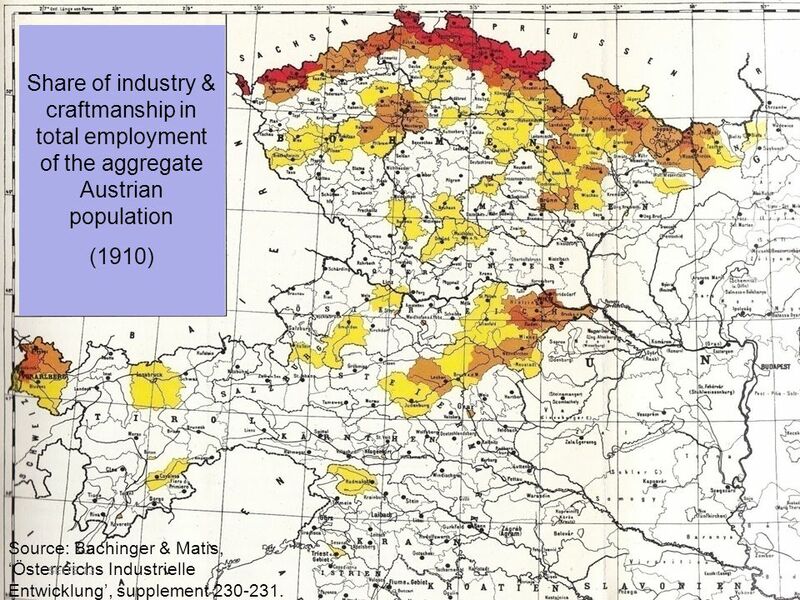 Eine Studie über die jüngste Entwicklung des Kapitalismus‘ (Vienna 1910). J. Johanson and J.-E. Vahlne, ‘The Mechanism of Internationalisation’, International Marketing Review, vol. 7, issue 4 (1993), J. Johanson and J.-E. Vahlne, ’The Uppsala internationalization process model revisited: From liability of foreignness to liability of outsidership’, Journal of International Business Studies, vol. 40 (2009), H. Kahr, ‘Die Österreichischen Banken zwischen 1913 und 1926‘, unpublished Master Thesis (Vienna University of Economics and Business 1977). G. Kaltenbeck and A. Schubert, ‘Size Matters – Does it? – Two very Different Episodes of Eastward Expansion of Austrian Banks’, Paper presented at the European Association for Banking and Financial History e.V. (EABH) Conference 2009 (Nikosia, Cyprus 2009). 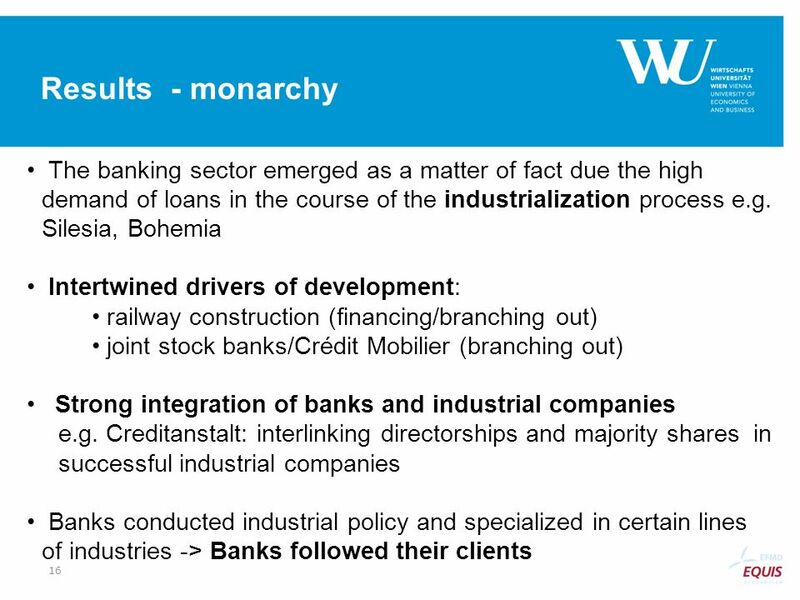 H. Kernbauer, and F. Weber, ‘Multinational banking in the Danube basin - The business strategy of the Viennese banks after the collapse of the Habsburg monarchy, in A. Teichova, M. Levy-Leboyer, and H. Nussbaum (eds. 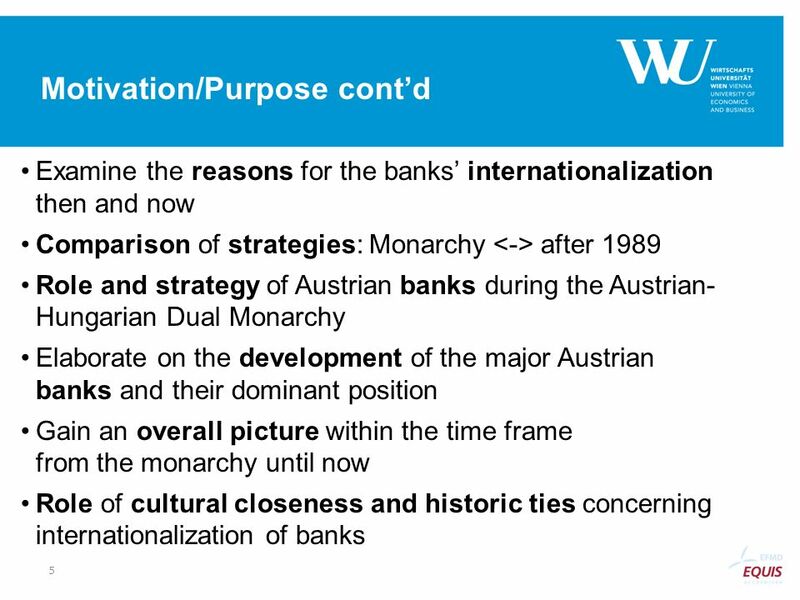 ), Multinational enterprise in historical perspective (Cambridge 1986), H. Kernbauer and F. Weber, ‘Multinationales Banking im Donauraum? Die Geschäftspolitik der Wiener Großbanken ‘, Österreichische Zeitschrift für Geschichtswissenschaften ÖZG 4/1993/4 (1993). S. Magri, A. Mori and P. Rossi, ‘The entry and the activity level of foreign banks in Italy: An analysis of the determinants’, Journal of Banking & Finance, vol. 29, issue 5 (2004), E. März, Österreichische Industrie und Bankpolitik in der Zeit Franz Josephs I. Am Beispiel d. k.k. priv. Österr. Credit-Anst. f. Handel u. Gewerbe (Vienna, Frankfurt, Zurich 1968). E. März and K. Socher, ‘Währung und Banken in Cisleithanien‘, in A. Brusatti, Die Habsburgermonarchie 1848–1918, vol. 1, Die wirtschaftliche Entwicklung, Verlag der Österreichischen Akademie der Wissenschaften (Vienna 1973), P. Mauro, N. Sussman and Y. Yafeh, ‘Emerging Market Spreads: Then Versus Now‘, The Quarterly Journal of Economics, MIT Press, vol. 117, issue 2 (2002), J. Mentschl, ‘Das Österreichische Unternehmertum‘, in A. Brusatti, Die Habsburgermonarchie 1848–1918, vol. 1, Die wirtschaftliche Entwicklung, Verlag der Österreichischen Akademie der Wissenschaften (Vienna 1973), A. Nentwich, ‘Die Bedeutung Wiens als Finanzzentrum in den Jahren 1918 bis 1929‘, unpublished Master Thesis , WU Wien, 1986). 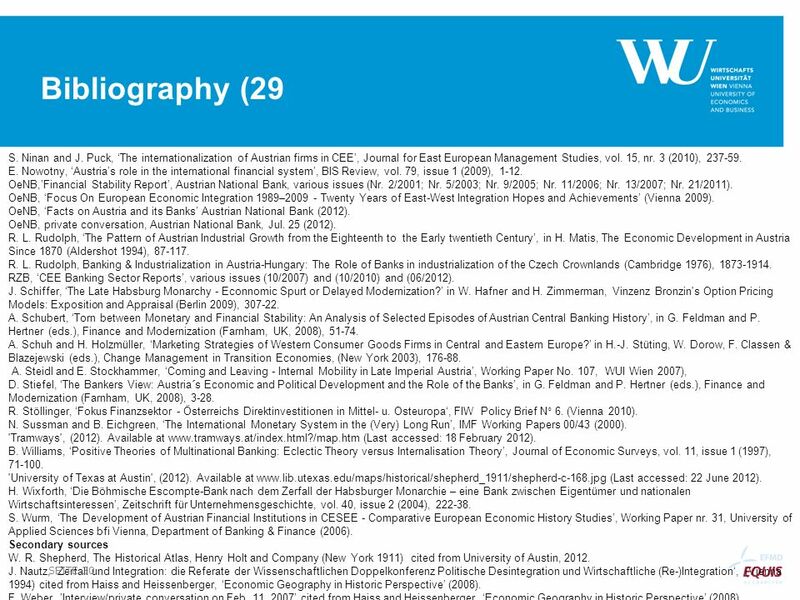 30 Bibliography (29 S. Ninan and J. Puck, ‘The internationalization of Austrian firms in CEE’, Journal for East European Management Studies, vol. 15, nr. 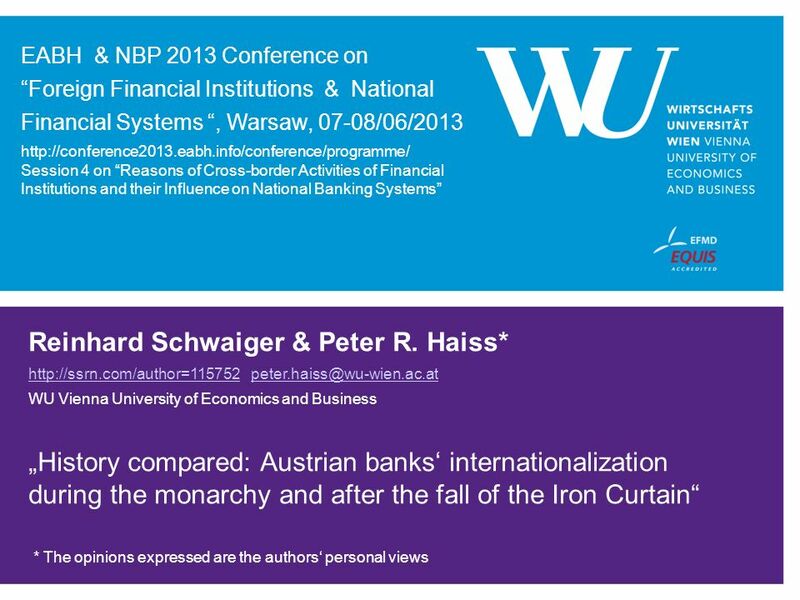 3 (2010), E. Nowotny, ‘Austria’s role in the international financial system’, BIS Review, vol. 79, issue 1 (2009), 1-12. OeNB,’Financial Stability Report’, Austrian National Bank, various issues (Nr. 2/2001; Nr. 5/2003; Nr. 9/2005; Nr. 11/2006; Nr. 13/2007; Nr. 21/2011). OeNB, ‘Focus On European Economic Integration 1989– Twenty Years of East-West Integration Hopes and Achievements’ (Vienna 2009). 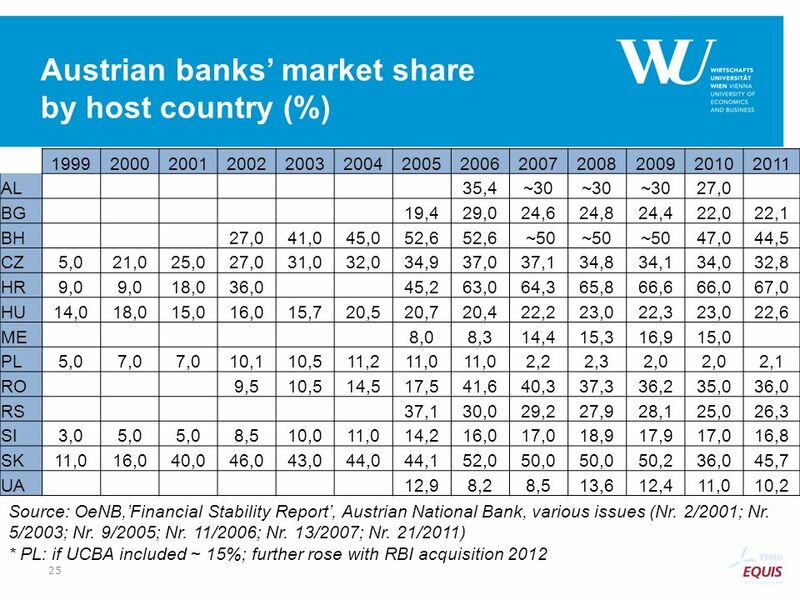 OeNB, ‘Facts on Austria and its Banks’ Austrian National Bank (2012). OeNB, private conversation, Austrian National Bank, Jul. 25 (2012). 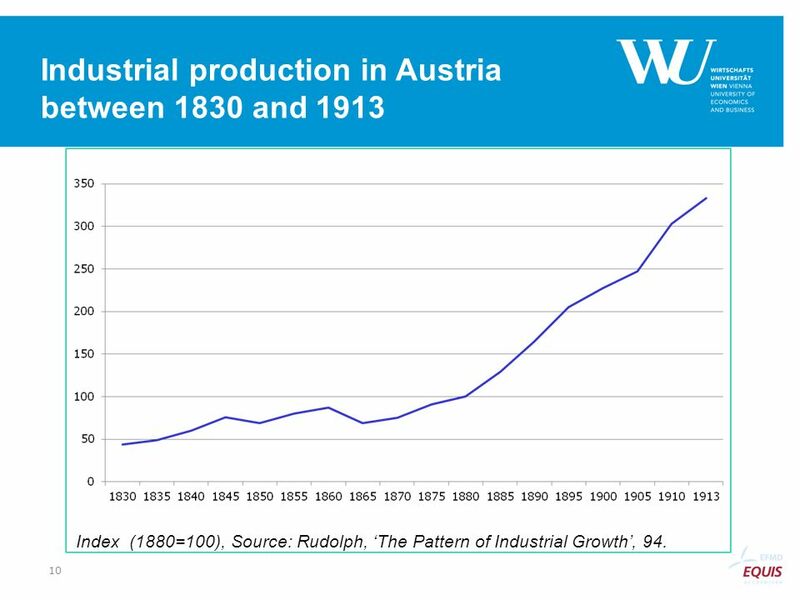 R. L. Rudolph, ‘The Pattern of Austrian Industrial Growth from the Eighteenth to the Early twentieth Century’, in H. Matis, The Economic Development in Austria Since 1870 (Aldershot 1994), R. L. Rudolph, Banking & Industrialization in Austria-Hungary: The Role of Banks in industrialization of the Czech Crownlands (Cambridge 1976), RZB, ‘CEE Banking Sector Reports’, various issues (10/2007) and (10/2010) and (06/2012). 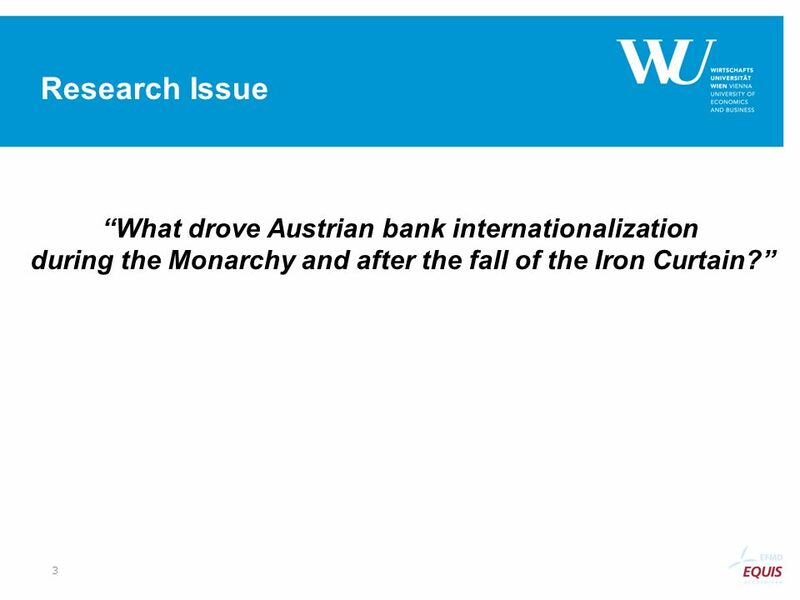 J. Schiffer, ‘The Late Habsburg Monarchy - Econnomic Spurt or Delayed Modernization?’ in W. Hafner and H. Zimmerman, Vinzenz Bronzin's Option Pricing Models: Exposition and Appraisal (Berlin 2009), A. Schubert, ‘Torn between Monetary and Financial Stability: An Analysis of Selected Episodes of Austrian Central Banking History’, in G. Feldman and P. Hertner (eds. 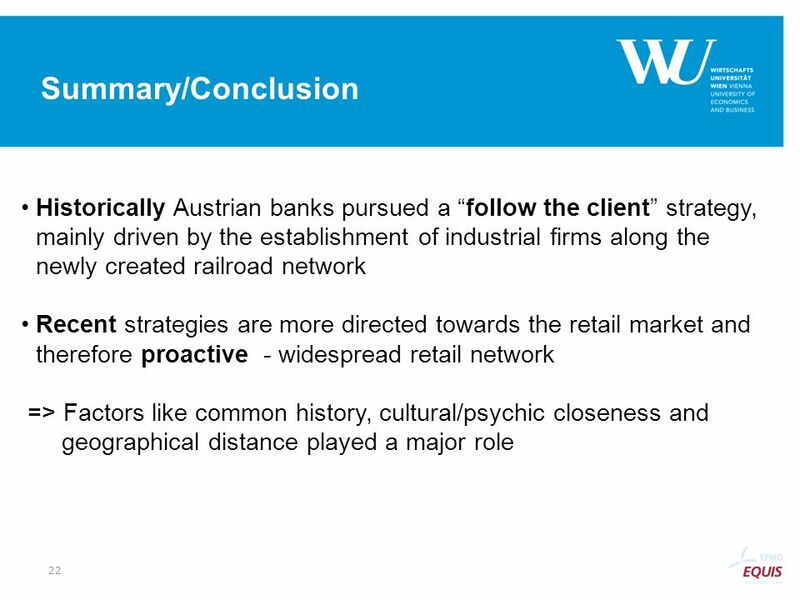 ), Finance and Modernization (Farnham, UK, 2008), A. Schuh and H. Holzmüller, ‘Marketing Strategies of Western Consumer Goods Firms in Central and Eastern Europe?’ in H.-J. Stüting, W. Dorow, F. Classen & Blazejewski (eds. 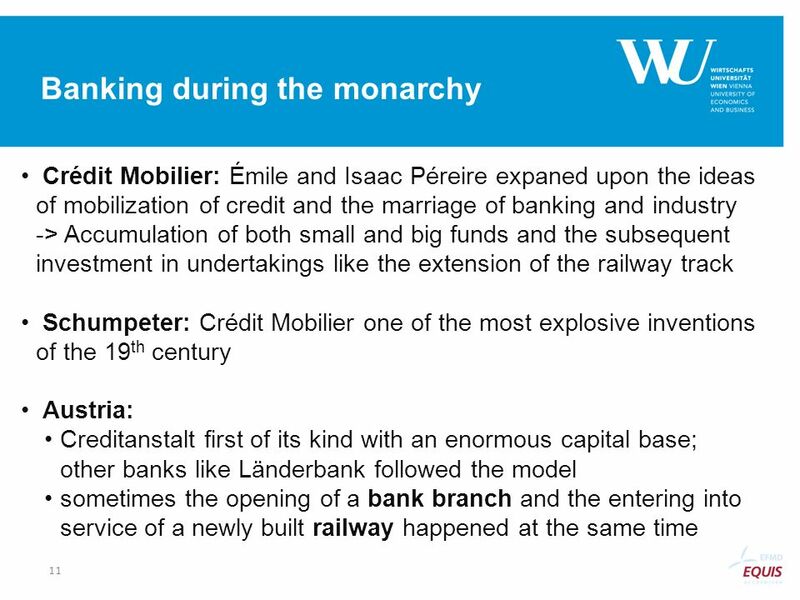 ), Change Management in Transition Economies, (New York 2003), A. Steidl and E. Stockhammer, ‘Coming and Leaving - Internal Mobility in Late Imperial Austria’, Working Paper No. 107, WUI Wien 2007), D. Stiefel, ‘The Bankers View: Austria´s Economic and Political Development and the Role of the Banks’, in G. Feldman and P. Hertner (eds. ), Finance and Modernization (Farnham, UK, 2008), 3-28. R. Stöllinger, ‘Fokus Finanzsektor - Österreichs Direktinvestitionen in Mittel- u. Osteuropa‘, FIW Policy Brief N° 6. (Vienna 2010). N. Sussman and B. Eichgreen, ‘The International Monetary System in the (Very) Long Run’, IMF Working Papers 00/43 (2000). 'Tramways', (2012). Available at (Last accessed: 18 February 2012). B. Williams, ‘Positive Theories of Multinational Banking: Eclectic Theory versus Internalisation Theory’, Journal of Economic Surveys, vol. 11, issue 1 (1997), 'University of Texas at Austin', (2012). Available at (Last accessed: 22 June 2012). H. Wixforth, ‘Die Böhmische Escompte-Bank nach dem Zerfall der Habsburger Monarchie – eine Bank zwischen Eigentümer und nationalen Wirtschaftsinteressen’, Zeitschrift für Unternehmensgeschichte, vol. 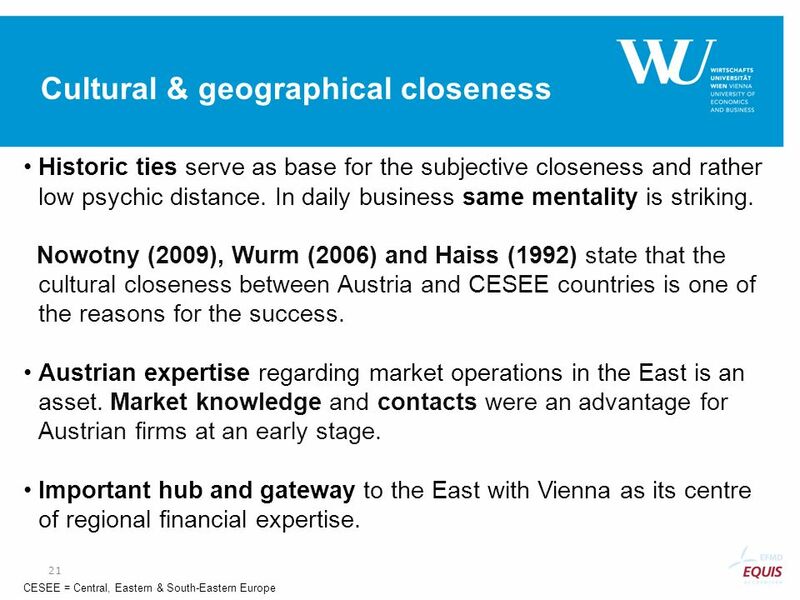 40, issue 2 (2004), S. Wurm, ‘The Development of Austrian Financial Institutions in CESEE - Comparative European Economic History Studies’, Working Paper nr. 31, University of Applied Sciences bfi Vienna, Department of Banking & Finance (2006). Secondary sources W. R. Shepherd, The Historical Atlas, Henry Holt and Company (New York 1911) cited from University of Austin, 2012. 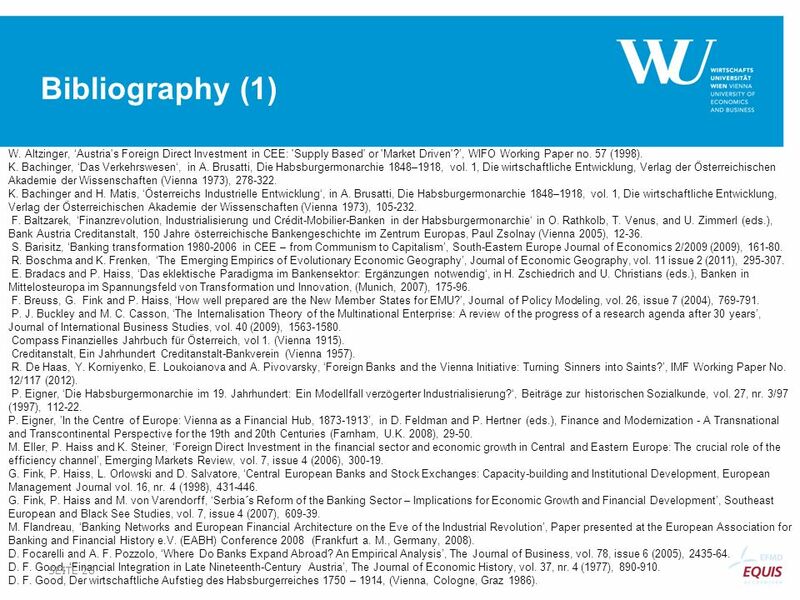 J. Nautz, ‘Zerfall und Integration: die Referate der Wissenschaftlichen Doppelkonferenz Politische Desintegration und Wirtschaftliche (Re-)Integration‘, (Vienna 1994) cited from Haiss and Heissenberger, ‘Economic Geography in Historic Perspective’ (2008). F. Weber, ’Interview/private conversation on Feb. 11, 2007’ cited from Haiss and Heissenberger, ‘Economic Geography in Historic Perspective’ (2008). Download ppt "Reinhard Schwaiger & Peter R. Haiss*"
1 Radio Maria World. 2 Postazioni Transmitter locations. Jack Jedwab Association for Canadian Studies September 27 th, 2008 Canadian Post Olympic Survey. 2008 Pan-European Private Equity & Venture Capital Activity EVCA, The Voice of European Private Equity Industry since 1983. Trend for Precision Soil Testing % Zone or Grid Samples Tested compared to Total Samples. Slide 1Fig 26-CO, p.795. Slide 2Fig 26-1, p.796 Slide 3Fig 26-2, p.797. Ph.D. Completion and Attrition CGS Board of Directors December 4, 2007. 1 Changing Profile of Household Sector Credit and Deposits in Indian Banking System -Deepak Mathur November 30, 2010.